Can I select an item from my Potluck before I send my invitation? 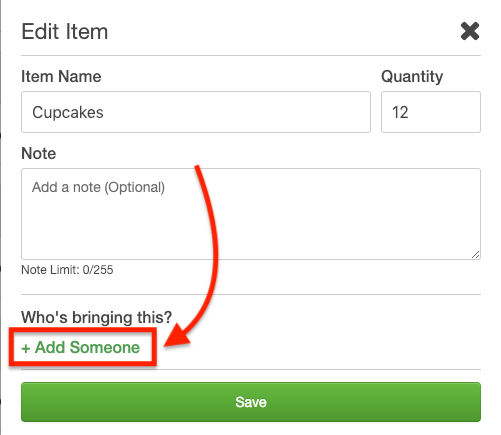 If you'd like to choose an item from your Potluck list before sending invitations, first head to the Potluck page and click on the Notepad icon for that item. Then, click the Add someone link. After that, choose the I'm bringing option and select the quantity. When you are finished, make sure to click on the green Save button. To choose an item from your Potluck list before sending invitations from the mobile app, tap on the Invitation Options button on the Review and Send page. From there, tap on the Add button for the Add a potluck option. 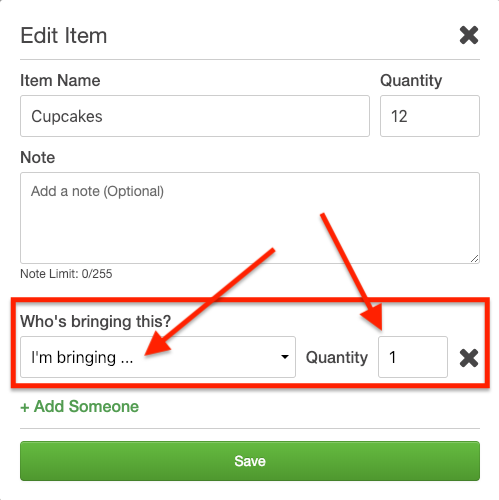 After you have created your Potluck list, click on the Edit option for the item you would like to select. Next, click the Add someone link and choose I'm bringing. When you are finished, make sure to click on the blue Save button.